Just a month ago, everything was going swimmingly for Jack Roslovic in his rookie season for the Winnipeg Jets — he was in the lineup every night, logging important minutes and hitting the scoresheet with consistency. It seemed a given that the 21-year-old forward would be a factor in the Jets’ playoff run. Now, how big a part he’ll play in the Jets’ quest for the Cup is cloudy. Due to a combination of players returning from injury, a lack of special teams experience and a playoff push, Roslovic’s been set to the side lately. The Jets punched their ticket to the Stanley Cup Playoffs on Mar. 25 thanks to a 5-4 shootout win against Nashville. They’ll certainly be bringing the whiteout back to Winnipeg. The real question now is whether Roslovic will be given the chance to be a part of the storm. Roslovic lit it up in the AHL for the first half of the season, putting up 35 points in just 32 games. 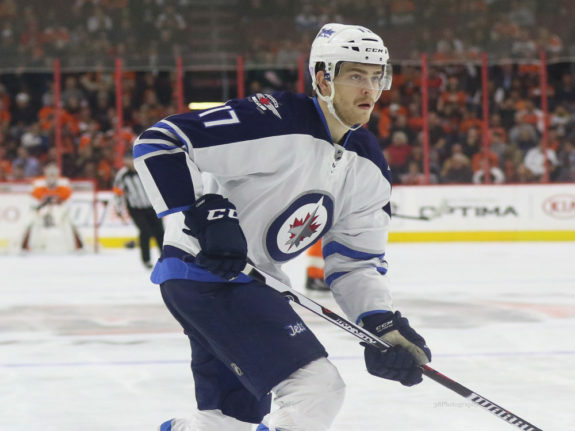 The top point producer on a high-octane Manitoba Moose team, the explosive and energetic forward helped his case for a call-up and put Jets brass on notice with prolific performances like this four-point effort against the Chicago Wolves. 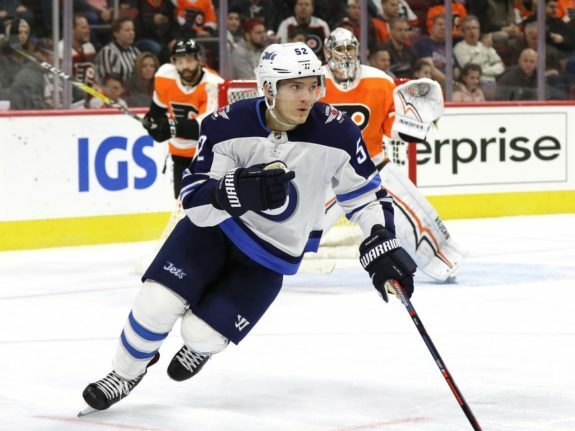 After Mark Scheifele was injured in a game against the Edmonton Oilers in late December, the Jets rewarded Roslovic for his efforts by promoting him to the big club on Dec. 30. However, some questioned whether Roslovic would be given a fair shake or if he was going to be relegated to the role of the extra forward. The Jets quickly quashed fears that he would be stranded in the press box or get more use out of his suit than his jersey. Paul Maurice wasted no time getting Roslovic into the lineup — seeing no point in having him up but not playing — but did put the young forward a “trial period,” so to speak. He started him out on the fourth line and gave him about ten minutes of ice time per game. That represented a major departure from his role with the Moose, in which he was heavily used by Pascal Vincent as one of the team’s main offensive weapons. Roslovic didn’t record any points in his first eight games. Prior to a game against Anaheim, though, Maurice promoted him to the top line with Patrik Laine and Blake Wheeler to provide a new spark to the two the head coach were flickering. Maurice praised his play despite not recording any points. The move garnered immediate results. In his first game on the top line, Roslovic scored his first NHL goal — a pivotal tally that drew the Jets even at 3-3 midway through the third period of a dogfight. The increased opportunity led to increased numbers for the first-year forward. In his next 14 games — four of which were on the first line — he started finding results. Even though he was bounced between the top and bottom six and skated with a variety of players including Mathieu Perreault and Bryan Little, his point totals and confidence climbed. He tallied two goals and seven assists during that stretch, showing the playmaking ability, hard shot and good hands that made him so successful with the Moose. Strangely, Roslovic found himself unceremoniously ousted from the lineup after one of his strongest performances of the season. He had a goal and an assist in a 6-2 beatdown against the Chicago Blackhawks, despite logging under eight minutes of ice time. Roslovic hadn’t — and still hasn’t — been given any opportunities on the power play or the penalty kill since his recall. When Brandon Tanev, a stalwart on the penalty-kill, was ready to return prior to the tilt against Dallas on Mar. 19, Roslovic got pushed to the press box. Despite scratching him, Maurice said Roslovic wouldn’t be out “permanently,” and that his play against Chicago, in which he played centre, was “real good.” However, it seems the fact that Roslovic doesn’t play on the power play or penalty kill has killed his chances of getting back in the lineup, and that he’s been pushed out by players seen as more versatile. Maurice claimed Roslovic would play down the road and get his shot again. That shot hasn’t come as of yet, although Maurice said “he’s part of this.” Roslovic’s participated in warmup, but hasn’t actually played since the Chicago game. That’s not truly being a part of it. Roslovic’s been out for four straight games, and with the Jets winning them all, Maurice may see his lineup as an “if it ain’t broke, don’t fix it” type of situation. 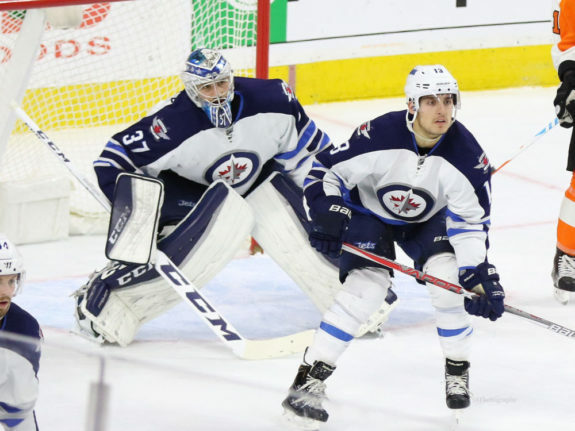 The longer the Jets succeed without Roslovic, the tougher it will be for him to get back in. It may be even tougher come playoff time, as Maurice could very well opt for experience over energy and leave Roslovic as a spectator. Scoring historically goes down in the Stanley Cup Playoffs, and grinders and wily vets often play key roles. Grinders do the dirty work and wear their opponents down with hard checking and toughness — both of which increase in importance in a six or seven game series. Veterans provide a calming presence and mettle that only comes with having been to the dance before. These players seems to disproportionally act as playoff heroes. For example, Brad May — more known for his knuckle-chucking than goal scoring — notched the famous “mayday goal” in overtime to complete Buffalo’s first-round sweep of Boston in 1993. The combination of decreased scoring and the ramped-up importance of veterans may give Maurice less incentive to dress players like Roslovic — offensively talented, but inexperienced and not necessarily physical. After all, the playoffs are a time for winning, not developing. Adam Lowry and Brandon Tanev fit the definition of the quintessential playoff workhorse better than Roslovic does. Compounding matters and hurting Roslovic’s chances even further is the fact playoff experience is at a premium on the Jets roster. Since relocation from Atlanta in 2011, the Jets have played just four playoff games, and in 12 mainly futile seasons, Atlanta qualified only once and got swept. Players who have been in the organization for years such as Blake Wheeler, Tobias Enstrom and Bryan Little are relatively green to meaningful April hockey. For many of the Jets young guns, such as Patrik Laine, Kyle Connor and Nikolaj Ehlers, the 2018 playoffs will be their maiden playoff voyage. The Jets’ strategy, therefore, could be to simply get as many veterans into the lineup as possible to complement the few players, such as Paul Statsny and Dustin Byfuglien, who have well-trod the playoff road. This could lead them to favour dressing a player like Shawn Matthias who’s played more than 500 career contests. Since Roslovic isn’t an established offensive dynamo like the three aforementioned young guns, Maurice may be loath to add another man to his fleet of players with no playoff experience. The Jets need to be honest with Roslovic. They need to tell him, straight up, whether if he’s in their master plan down the stretch and into a potentially lengthy playoff trek or if he’s been axed from the blueprints for now. Opaqueness helps nobody in this situation. At just 21, Roslovic is still very young, and there’s little doubt all his assets will eventually translate into a steady gig for Winnipeg. However, the Jets’ handling of Roslovic as of late indicate that time is not now, and that’s understandable. If he’s not in this year’s plans, the Jets shouldn’t string him along. They should send him back down to the Moose and allow him to take part in their Calder Cup run. This would undoubtedly initially disappoint him, but would allow him to get back to playing meaningful hockey and developing both as a player and as a person. No one can become a better hockey player by watching, or else we’d all be NHL stars. Wherever Roslovic is, the most important part is that he plays. Because very soon — if not now — the Jets are going need him to play important minutes and help win games.